Nicole is 19 years old and poised to make her mark on the world. She is a theatre major at Yale and has a prestigious internship for the summer which will start as soon as she finishes her pre-summer checklist. At a routine eye appointment, her doctor discovers something ominous and Nicole soon learns that she has retinitis pigmentosa. The disease will rob her completely of her sight and there is no cure. Nicole decides to get her fill of life while she still can and spends the next few years traveling the world, going to circus school, pursuing her acting career, and meeting lots of handsome men. But something makes Nicole stop in her tracks - she has children. She knows that she will do anything to protect them and that means that she must protect herself, by finally revealing her disease to the people around her. I started reading this memoir with some apprehension. I have been a part of the eyeglasses club since the age of seven, so I can relate on some level to watching your vision decrease. While Nicole's story is candid and sad, she manages to tell it with a wonderful sense of self-deprecating humor. She decides that she will not be defined by her disease - she is going to go out into the world and have fun. This works until she realizes that she shouldn't drive because she is losing her peripheral vision and that she is stranded at parties because she can't find her way out in the dim light. Her stubborn refusal to ask for help is both frustrating and incredibly human. While this book is about sight and its absence and how to deal with that, it is also a book about relationships and family. We witness Nicole growing up as she goes from one night stands to starting a relationship with the man who will become her husband. And then, just like every parent, Nicole's life changes radically when she has children. Her insights into the bond between a child and his mother are poignant and some of the best parts of this story. 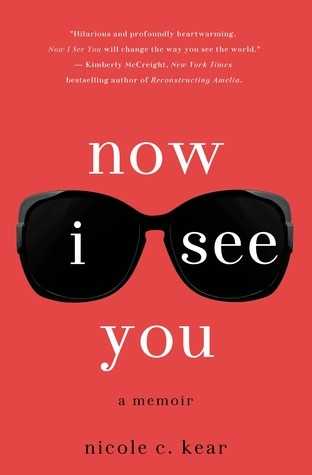 Now I See You is a quick read that will make you thankful for the things you take for granted, like being able to see each day. Nicole's experiences will reaffirm your belief in the goodness of people and the things you can accomplish if you refuse to let your limitations define you. It is a funny and easy read considering the heavy topic! Sounds like a good book. I already had my eye on it before and your review makes it appealing. We need to always remember to be grateful for whatever we have in life. The plot of this sounds really interesting, especially as an eye glasses wearer myself, so I'll be keeping my eyes (no pun intended) for this one. Thanks for sharing! Sounds like a good read, which is odd to say when it's a book about losing your sight, but Nicole sounds like a great character. I'll have to look for this at the library. Thanks for the recommendation! It's certainly a topic I don't see very often, but I think it is one that many people can relate to! The narration is really funny too, which I think balances out the tough story. I loved this book! Your review is spot on. There were parts where I was laughing out a loud and parts where I was teary eyed at how she described her fears of going blind. I also kept reading parts out loud to my husband because I just *had* to share this book with someone. Thanks Virginia! It's a really funny book about a tough issue, isn't it? ?